The pair continues to go down slowly amid negative data on the UK inflation. In addition, UK consumer price index has also declined to the level of 2% in December 2013. Today’s key event is a speech of Mark Carney, who will definitely touched the subject of inflation decline and will sketch out prospects of further economic growth. As expected, US retail sales fell to 0.2% in December 2013. Attention today shall be paid to the US “Beige book,” the data on initial application for unemployment benefits and consumer price index. The Pound is under pressure from macro-economic statistics. If the data on retail sales, which will become known on Friday, will be negative, the pair GBP/USD can fall to support level of 1.6320. 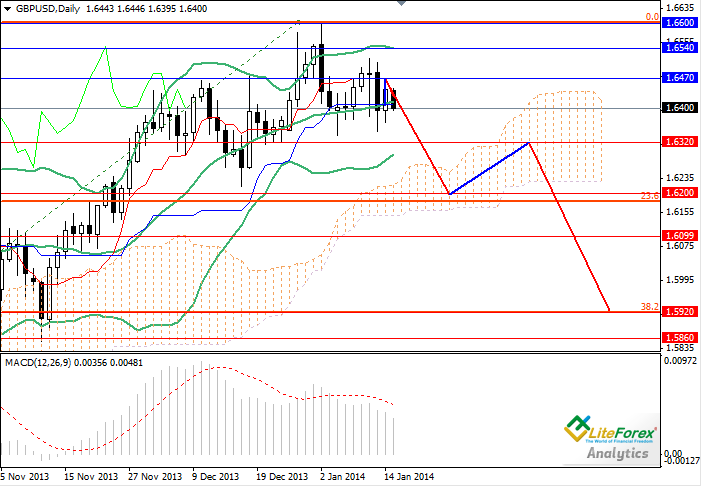 In the medium-term down trend can maintain with the targets of 1.6100 and 1.5920. It is recommended to place short positions at the level of 1.5950. Pending sell orders can be placed at the level of 1.6470 with profit taking of 1.6200-1.5950.